You are cordially invited to attend our Marine Corps League-South Coast Detachment’s (MCL-SCD) Surf & Turf Festival set for Saturday, July 27th from 4PM to 8PM, at Doheny State Beach (Picnic Areas A & B). This fun filled evening with our Marines & Sailors includes: Live Music, Hilarious & Authentic Wild West Skits put on by our own Local Acting Troop “Spurs & Satin” and a fabulous surf and turf feast – an assortment of Appetizers, luscious libations (Beer, Wine, & Margaritas with your first drink on the House), and a delicious Surf & Turf Dinner with rotisserie Chicken, Brisket, and Smoked Salmon catered by Fire Breather BBQ. Your meal will culminate with a wide variety of decadent Deserts to select from. Reservations are only $60/Person General Admission (Children ages 10 and under $10), or only $85/Person for early entry to join the Commandant’s Hero’s Happy Hour reception. Reservations, along with the ability to sponsor a Marine or Sailor to join the Commandant’s Hero’s Happy Hour, may be made by Clicking on the appropriate, secure, PayPal link. Event Sponsorships may be made in the same manner. 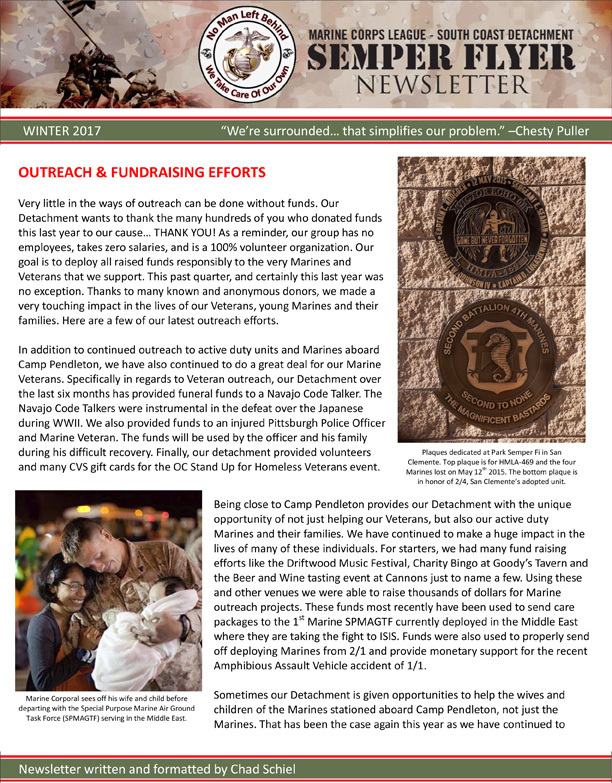 If you prefer, you may send your check to our Marine Corps League-South Coast Detachment, P.O. Box 3775, San Clemente, CA 92674-3775. (Memo Section: Reservations # and/or Marines Sponsored #). Proceeds from this outing will be used to take care of our Marines, Sailors, and their Families, especially during the Holidays. We stand ready to meet any Family Emergency Need in less than 24 Hours. We are at the ready 24/7. Directions and a Map to the Doheny State Beach Picnic Area Site may be accessed below. There is ample Metered Parking to accommodate all our Guests. Please hurry and make your Reservations before we reach our Maximum Capacity. Without fail all of our Events Sell Out. Our Marines, Sailors, and I look forward to being in your company.